Please use our size charts located below each product type. Our sizes are listed as European and are measured in metric for full garment measurements. 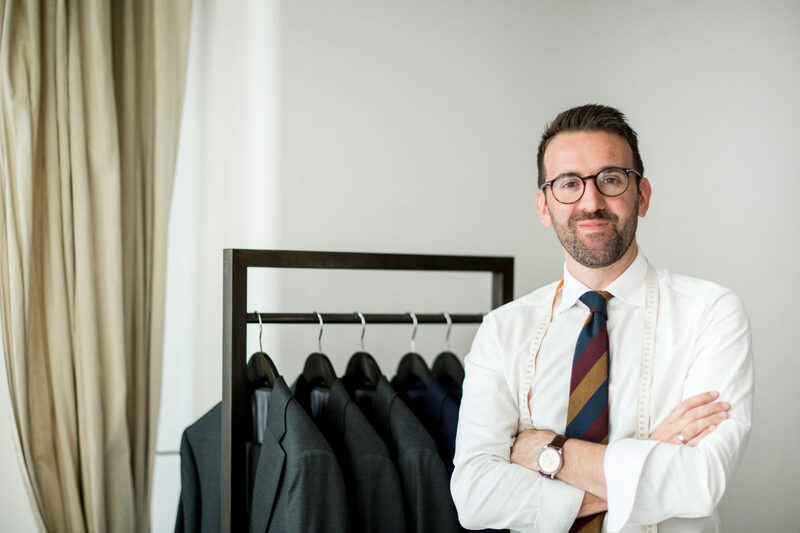 Check your current suit sizes for an indication, or alternatively take your body measurements bearing in mind that you should allow an allowance of 2-4cm for slim fit and 6-8cm for a comfortable fit around the chest, waist and hips. What is a floating canvas chest piece? The interlinings of all of jackets are made of a 100% natural horsehair canvas. This is used to give the jacket it shape and structure and is used in place of synthetic fusing, which many other brands use. The advantage of a horsehair canvas construction is comfort, additional breathability, and longevity. No, you do not need to, but if you would like us to keep your details and purchases on file in order to facilitate ease of future purchases, we would recommend you do so. You will also be the first to be notified of any promotions and campaigns. We use Stripe, therefore VISA, MasterCard and American Express are all accepted at point of sale without any surcharges. Which countries do you ship to and is there a cost? We provide free shipping within Australia for all amounts over $100 AUD. A flat rate of $15.00 AUD is applied to purchases under $100 AUD. For international shipping, we use DHL, please enter you shipping address into the cart and your rate will be calculated. Please note additional shipping; duty and taxes may apply when goods arrive at the destination. Please check with your local DHL office for any additional charges that may apply. No, I’m afraid DHL require a physical address. All jackets and trousers are 100% made to order, we do not keep stock. This allows us to keep our pricing competitive and product current. Each product will have a designated lead and delivery time specified on its own page. This ranges from 2-3 days for local stocked accessories to 2-3 weeks for made to order tailored garments. You will be issued with a DHL or Australian Post tacking number as soon as your items leave our studio. No, once an order has been placed, it will make it way to you. Yes, we offer a 14-day free return or exchange policy. If you are unsatisfied with your garment, a full refund will be credited to the method of payment used at original time of purchase. If your concern can be resolved through adjustment or replacement we will endeavor to meet your needs as efficiently as possible. Please refer to and use the return slip, which accompanied your product at time of delivery. How should I take care of my suit? Your garments are made with the utmost of care, and are created using only natural fibres. We therefore recommend minimal dry cleaning depending on the frequency of wear. If your jacket or trousers are worn weekly or bi weekly, dry cleaning should be considered every 4-6 months. We recommend that you dust down or brush your garments on a weekly basis; this will eliminate the build of dust and grime. You should also keep your jacket on an appropriate hanger in order to keep its shape. Avoid ironing and pressing the garments yourself, you don’t want to burn the cloth. For the removal of light creases and odour, hang your garments in the bathroom whilst showering. The steam will help. Do you offer alterations for my Carl Navè suit? If you are located in Melbourne and would like your suit to be professional fitted to you, please contact us directly at time of sale and you can select to collect your suit from our Melbourne location. Additional fees may apply depending on the level of adjustment required.